For other uses, see Human shield (disambiguation). The Barricade by the American artist George Bellows inspired by an incident in August 1914 where German soldiers used Belgian civilians as human shields. After World War II, it was claimed by German SS general Gottlob Berger that there was a plan, proposed by the Luftwaffe and approved by Adolf Hitler, to set up special POW camps for captured airmen of the Royal Air Force and the United States Army Air Forces in large German cities, to act as human shields against their bombing raids. Berger realized that this would contravene the 1929 Geneva Convention and argued that there was not enough barbed wire—as a result, this plan was not implemented. Wehrmacht and later SS forces extensively used Polish civilians as human shields during Warsaw Uprising when attacking the insurgents' positions. At the Wola massacre in Poland on 7 August 1944, the Nazis forced civilian women onto the armored vehicles as human shields to enhance their effectiveness. In Belgium in May 1940, at least 86 civilians were killed by the German Wehrmacht known as the Vinkt Massacre, when the Germans took 140 civilians and used them as shields to cross a bridge while under fire. During the Battle of Okinawa, Japanese soldiers often used civilians as human shields against American troops. When the Japanese were concerned about the incoming Allied air raids on their home islands as they were losing their controlled Pacific islands one by one to the Allies in the Pacific War, they scattered major military installations and factories throughout urban areas, therefore, historians argued that Japan was using its civilians as human shields to protect their legitimate military targets against Allied bombardment. As a result, the U.S. Army Air Forces (USAAF) was unable to strike purely military targets due to the limitations of their bombsight, the mixing of military installations and factories with urban areas, and the widespread of cottage industry in Japan's cities. This led the USAAF in early 1945 to switch from precision bombing to carpet bombing which destroyed 67 Japanese cities with incendiary bombs and the use of atomic bombs on the Japanese cities of Hiroshima and Nagasaki. In the Battle of the Notch North Korean forces were claimed to have used captured U.S. soldiers as human shields while advancing. During the 1982 Lebanon War, the Palestinian refugee camp of Ain al-Hilweh was surrounded by Israeli forces as the last stronghold of Palestinian militants in southern Lebanon, but "Soldiers of Allah" militants commanded by the Muslim fundamentalist Haj Ibrahim refused to surrender: Their motto was "Victory or death!" Over a two-day period, Israeli forces under the leadership of Brigadier General Yitzhak Mordechai repeatedly announced "Whoever does not bear arms will not be harmed" and urged civilians in the camp to evacuate, but few did. Three delegations of prominent Sidon figures were sent to persuade Haj Ibrahim's fighters that "their cause was hopeless, and whoever was willing to lay down his arms would be allowed to leave the camp unharmed." None of the delegations were successful; the first was prevented from approaching the fighters by "a spray of bullets," while the third "returned with the most harrowing tale of all": "Militiamen were shooting civilians who tried to escape. In one particularly grisly incident, three children had been riddled with bullets before their parents' eyes because their father had dared to suggest calling an end to the fighting." After a delegation of Palestinian POWs—"headed by a PLO officer who was prepared to give the defenders his professional assessment of Ein Hilweh's grave military situation"—and an offer by Mordechai to "meet personally with" Haj Ibrahim were also rebuffed, "a team of psychologists ... was flown to Sidon to advise the command on how to deal with such irrational behavior." However, "the best advice the psychologists could offer was to organize yet another but considerably larger delegation comprising some forty or so people and including women and children"; Haj Ibrahim responded to the fifth delegation with "exactly the same three words"—triggering a bloody battle in which Israeli troops finally took the camp. Operation Blue Star was an Indian military operation carried out between 1 and 8 June 1984, ordered by Prime Minister Indira Gandhi to remove militant religious leader Jarnail Singh Bhindranwale and his armed followers from the buildings of the Harmandir Sahib complex in Amritsar, Punjab. Bhindranwale and large number of his militants were killed in the operation. There was a high civilian casualty (Total 493 including militants) also in the operation, since the militants had been using the pilgrims that had been trapped inside the temple as Human shields. The pilgrims were not allowed by the militants to escape from the temple premises in spite of relaxation in the curfew hours by the security forces. The militants had hoped that the presence of thousands of pilgrims inside the temple premises would have prevented the action by army. One of the most famous uses of human shields occurred in Iraq in 1990, following the Iraqi invasion of Kuwait that precipitated the Gulf War of 1990-1991. Saddam Hussein's government detained hundreds of citizens of Western countries who were in Iraq for use as human shields in an attempt to deter nations from participating in military operations against the country. A number of these hostages were filmed meeting Hussein, and kept with him to deter any targeted attacks, whilst others were held in or near military and industrial targets. Shortly after the cease-fire between Croat and Serb forces, the Bosnian Serbs launched an assault against the safe area of Goražde, heavily shelling the town and surrounding villages. Protests and exhortations from the UN Security Council turned out to be ineffective, and on 10 and 11 April 1994, NATO launched air strikes against Bosnian Serb positions. In retaliation, Bosnian Serb forces captured many UN personnel, using them as human shields at sites expected to be bombed. In a similar situation to what had happened in Sarajevo, an ultimatum was issued, and by the 24th, most of the Serb troops had complied. According to various accounts—including that of the American ambassador to the U.N., the Taliban used women and children from their own population as human shields against coalition forces in 2006, and 2007, and when the British attacked during August 2008 during the war in Afghanistan. See also: Criticism of Israel § "Neighbor Procedure"
According to Israeli defense officials, the Israel Defense Forces made use of the "human shield" procedure on 1,200 occasions during the Second Intifada (2000-2005), and only on one occasion did a Palestinian civilian get hurt. According to human rights groups Amnesty International and Human Rights Watch, the Israel Defense Forces (IDF) used Palestinian civilians as human shields during the 2002 Battle of Jenin. The Israeli human rights group B'Tselem said that "for a long period of time following the outbreak of the second intifada, particularly during Operation Defensive Shield, in April 2002, the IDF systematically used Palestinian civilians as human shields, forcing them to carry out military actions which threatened their lives". Al Mezan reported the systematic use of "human shields" during the invasion of Beit Hanoun in 2004. Human shields were also employed by Israeli soldiers to subdue a stone-throwing protest in Hebron in 2003. In 2002 the Supreme Court of Israel issued a temporary injunction banning the practice in the wake of the death of a Nidal Abu Mohsen (19) who was shot dead when he was forced by the IDF to knock on the door of his neighbor, Hamas militant Nasser Jarrar, in the West Bank village of Tubas and inform him of the Israeli army's demands that he surrender. In 2004, a 13-year-old boy, Muhammed Badwan, was photographed tied to an Israeli police vehicle in the West Bank village of Biddu being used as a shield to deter stone-throwing protesters. Rabbi Arik Ascherman was placed under arrest after he tried to intervene. In 2005, Israel's High Court of Justice banned the practice, with the Israeli Defense Ministry appealing the decision. While acknowledging and defending the "use of Palestinians to deliver warnings to wanted men about impending arrest operations", a practice known in Israel by the euphemism "neighbor procedure", the IDF denied reports of "using Palestinians as human shields against attacks on IDF forces", claiming it had already forbidden this practice. In 2006, however, initial investigations by B'Tselem indicated that the IDF might have used civilians as human shields in 2006 Beit Hanun. In February 2007, footage was released of an incident involving Sameh Amira, a 24-year-old Palestinian, who video showed serving as a human shield for a group of Israeli soldiers, getting inside apartments suspected to belong to Palestinian militants ahead of the soldiers. A 15-year-old cousin of Amira and an 11-year-old girl in the West Bank independently told B'Tselem in February 2007 that Israeli soldiers forced each of them in separate incidents to open the door of a neighboring apartment belonging to a suspected militant, get inside ahead of them, and open doors and windows. The Israeli Army launched a criminal investigation into the incident involving Amira. In April 2007, the Israeli army suspended a commander after the unit he was leading was accused of using Palestinians as human shields in a West Bank operation. In April 2007 CBS News reported that, according to human rights groups, the IDF did not stop the use of human shields, but the incidence was dropping. During the 2008–09 Gaza War known as Operation Cast Lead, Israeli military forces were accused of continuing to use civilians as human shields by Amnesty International and Breaking the Silence. According to testimonies published by these two groups, Israeli forces used unarmed Palestinians including children to protect military positions, walk in front of armed soldiers; go into buildings to check for booby traps or gunmen; and inspect suspicious objects for explosives. Amnesty International stated that it found cases in which "Israeli troops forced Palestinians to stay in one room of their home while turning the rest of the house into a base and sniper position, effectively using the families, both adults and children, as human shields and putting them at risk". The UN Human Rights Council also accused Israel of using human shields during the 2008–09 Gaza conflict. The Guardian compiled three videos and testimony from civilians about alleged war crimes committed by Israeli soldiers during the 2008–09 Gaza War, including the use of Palestinian children as human shields. In the videos three teenage brothers from the al-Attar family claimed that they were forced at gunpoint to kneel in front of tanks to deter Hamas fighters from firing at them and that they were used to "clear" houses for the Israeli soldiers. An IDF soldier's testimony for Breaking the Silence told that his commander ordered that for every house raided by the IDF, they send a "neighbor" to go in before the soldier, sometimes while the soldier placed his gun on the neighbor's shoulder; according to the soldier, "commanders said these were the instructions and we had to do it". Gazan civilians also testified of being used at gunpoint as human shields by Israeli soldiers. An Israeli military official responded to these allegations: "The IDF operated in accordance with the rules of war and did the utmost to minimise harm to civilians uninvolved in combat. The IDF's use of weapons conforms to international law." An Israeli embassy spokesperson alleged Hamas pressured the people of Gaza into making those accusations. On March 12, 2010, the Israel Defense Forces prosecution filed indictments against two staff sergeants of the Givati Brigade for forcing a 9-year-old Palestinian boy to open a number of bags they thought might contain explosives in January 2009. The boy told he was hit by the soldiers and forced to work for them at gunpoint. The IDF said it opened the investigation after the incident was brought to its attention by the United Nations. On October 3, 2010, a conviction in this matter, accompanied by a demotion and suspended sentence, was handed down by the military court against both defendants, though neither soldier was actually jailed. The sentence was criticized as too lenient by Human Rights Watch and the boy's mother. A United Nations human rights body accused Israeli forces in June 2013 of "continuous use of Palestinian children as human shields and informants", voicing with deep concern 14 such cases had been reported between January 2010 and March 2013. It says almost all accused soldiers involved in the incidents have gone unpunished. Defense for Children International-Palestine reported 17-year-old, Ahmad Abu Raida (also:“Reeda”), was kidnapped by Israeli soldiers, who, after beating him up and threatening him, at times with sexual overtones, used him as a human shield for five days, forcing him to walk in front of them with police dogs at gunpoint, search houses and dig in places soldiers suspected there might be tunnels. The New York Times stated that his assertions could not be independently corroborated; the Israeli military confirmed that he had been detained, noting his father's affiliation with Hamas, who was a senior official in the Gaza Tourism Ministry. No material evidence of the physical violence allegedly suffered by Raida, e.g. photos, medical reports or lingering wounds resulting from repeated blows, was produced. The Euro-Mid Observer for Human Rights published testimony that, during the 2014 Gaza War, Israeli soldiers used Palestinian civilians as shield in Khuza'a. A family, that also gave a video interview, recorded by Media Town, told the group that Israeli soldiers had killed the family's patriarch, a 65-year-old who was carrying a white flag, and proceeded to place family members, including children, by the house's windows and shoot from behind them. A UN official made the accusation that Israel used a school in Gaza as a military base. Israeli writer Amos Harel in Haaretz alleged that during the Second Intifada (2000–2005) Palestinian gunmen routinely used civilians and children as human shields and further alleges that there is photographic evidence. On 22 November 2006, Human Rights Watch (HRW) accused Muhammad Wail Baroud, a military commander in the Popular Resistance Committee, of using civilians for shielding homes against military attacks but later stated that they erred. There was no evidence that the house was being used for military purposes at the time of the planned attack, nor did the IDF explain what military objective it could have had. They considered the destruction in light of Israel's longstanding policy of destroying homes as punitive measures instead of as legitimate military targets. HRW acknowledged they did not consider the motives of the civilians, such as whether they willingly assembled or not, and emphasized that it did not want to criticize non-violent resistance or any other form of peaceful protest, including civilians defending their homes. The United Nations Fact Finding Mission on the Gaza Conflict ("UNFFMG") that took place in 2008-2009 accepted the possibility that Hamas launched mortar attacks from the vicinity of a school and from residential homes, sometimes by threat of force against residents. The UN Mission found evidence that "rocket units of the Palestinian armed groups operated from within populated areas" and used threats of force to enter residential yards, including one instance where a resident said that "his father had previously been shot in the leg by a member of such an armed group when he had tried to prevent them from using his land as a rocket launching site." Similarly, the report found evidence that Palestinian militants "fir[ed] a rocket from a courtyard of a Government school in Gaza City at a time when the schools were closed." A review article in Case Western Reserve Journal of International Law stated that Israel warned residents to leave by using warnings such as roof knocking and phone calls, and that "Israel asserted that Palestinian civilians who did not abide by the warnings were acting as 'voluntary human shields,' and were thus taking part in hostilities and could be targeted as combatants." The article determined this assertion to be unsupportable in international law. The Israeli Ministry of Foreign Affairs says Hamas now regularly uses human shields to protect the homes of Hamas officials. The Israeli Intelligence and Terrorism Information Center accused Hamas and other armed groups of making extensive use of human shields as integral part of their war doctrine, in order to prevent the IDF to target them, during the Gaza War (2008-2009). The IDF released footage allegedly showing Palestinian fighters using ambulances for military purposes. Magen David Adom, the Israeli ambulance and medical emergency service, submitted to the UN a report concluding the accusation was unfounded. Amnesty International investigated the repeated claims by Israel that Hamas was guilty of using human shields after the cessation of hostilities and found no evidence that Hamas or other Palestinian fighters "directed the movement of civilians to shield military objectives from attacks" however, as noted, many refused to speak with the UN and Amnesty and the evidence of the use of residential facilities is ample. The same organization asserted that "there was ample evidence to indicate that, in defiance of IDF rules, Israeli soldiers had used Palestinian civilians and children as shields to protect themselves" by sending Palestinians into homes where other militants were located and to encourage their surrender. In relation to Al-Fakhura school incident during the Gaza War of January 2009, Israel accused Hamas of "cynically" using civilians as human shields. A UN Board of Inquiry found that there was no firing from within the school and no explosives within the school. The Board could not establish with certainty whether there had been any firing from the vicinity of the school. The UN High Commissioner for Human Rights Navi Pillay accused Hamas militants of violating international humanitarian law by "locating rockets within schools and hospitals, or even launching these rockets from densely populated areas." The European Union condemned Hamas, and in particular condemned "calls on the civilian population of Gaza to provide themselves as human shields." France24 confirmed the use of urban warfare, filming a rocket launch pad which was placed in a civilian area next to a hotel where international journalists were staying. Peter Stefanovic of Australia’s Nine News tweeted that rockets had been fired "over our hotel from a site about two hundred metres away. So a missile launch site is basically next door.” Janis Mackey Frayer of Canada's CTV reported seeing a Hamas gunman dressed in a woman's headscarf with a "tip of a gun poked out from under cloak.” Harry Fear reporting for Russia Today tweeted that rockets were fired from near his hotel. His tweet was later deleted, and he was expelled from Gaza. Several journalists who alleged Hamas use of human shields and rocket locations close to civilian infrastructure reported being threatened by Hamas. In a September 2014 interview, a Hamas official acknowledged to Associated Press that the group fired at Israel from civilian areas. He ascribed the practice to "mistakes", but said the group had little option due to the crowded landscape of the Strip, with its dearth of open zones. He denied accusations that rockets were launched "from schools or hospitals when in fact they were fired 200 or 300 meters (yards) away". In a 2014 interview, a Hamas political leader Khaled Meshaal said to a CNN interviewer that the group did not use its people as human shields. In interviews with Gazan refugees, reporters for The Independent and The Guardian concluded it was a "myth" that Hamas forced civilians to stay in areas under attack against their will; many refugees told them they refused to heed the IDF's warnings because even areas Israel had declared safe for refugees had been shelled by its forces. The BBC Middle East editor Jeremy Bowen also said he "saw no evidence of Hamas using Palestinians as human shields". An Amnesty International document (dated July 25, 2014) asserts that they do "not have evidence at this point that Palestinian civilians have been intentionally used by Hamas or Palestinian armed groups during the current hostilities to “shield” specific locations or military personnel or equipment from Israeli attacks." Amnesty International's assessment was that international humanitarian law was clear in that "even if officials or fighters from Hamas or Palestinian armed groups associated with other factions did in fact direct civilians to remain in a specific location in order to shield military objectives from attacks, all of Israel’s obligations to protect these civilians would still apply." The human rights group, however, still found that Palestinian factions, as in previous conflicts, launched attacks from civilian areas. Hamas Arabic-speaking spokesman Sami Abu Zuhri called up Gaza civilians on Hamas’s Al-Aqsa TV July 8, 2014 to stay put in areas under fire by Israel, prompting accusations from Israel and others — the European Union, for example — that Hamas was calling on people to volunteer as "in effect human shields". For Amnesty International, however, Hamas' call may have been "motivated by a desire to avoid further panic" among civilians, considering both the lack of shelters in Gaza and the fact that some civilians who heeded the IDF's warnings had been casualties of Israeli attacks. In a press conference on September 6, 2014, Mahmoud Abbas alleged "that Hamas had killed 120 Fatah members who broke the curfew." Israeli soldiers recounted "Suddenly, a small boy appeared, and the terrorist grabbed him and escaped with him"; "I saw with my own eyes someone using another person, a woman, as a shield ... And I can see very clearly that the woman doesn't want to be there and he's pulling her with him"; and "We even found explosives in nurseries. The whole neighborhood was practically a terrorist base." Scott Ewing, Cavalry Scout, 3rd Armored Cavalry Regiment, US Army, who served in Iraq in the 2005-2006 period, stated that US troops would give candy to Iraqi children so they would stay around their vehicles, thereby making more likely that "the bad guys wouldn't attack. We used the kids as human shields". Australian journalist Chris Link reported what he claimed were photographed incidents during the 2006 Lebanon War in which Hezbollah used Lebanese civilians as human shields to dissuade the IDF from firing at gunmen and rocket launchers. The alleged incidents occurred in the Christian area of Wadi Chahrour in Eastern Beirut removed from the primary war zone of South Lebanon. Human Rights Watch conducted its own investigation and reported that Hezbollah did not "deliberately" use civilians as a deterrent from IDF attack. HRW did however conclude Hezbollah stored weapons "in or near civilian homes" and fighters launched rockets within populated areas and near UN observers. HRW also accused Hezbollah of using Lebanese homes as sites for rocket launchers, usually without the homeowner's knowledge or permission, putting large numbers of civilians at risk. On July 25, 2006, Israeli forces attacked and destroyed an UN observer post in southern Lebanon, resulting in four deaths. One of the fatalities, Canadian Major Paeta Derek Hess-von Kruedener, had sent an e‑mail to his former commander, retired Major-General Lewis MacKenzie, several days before his death in which he described the Israeli bombardment, writing "The closest artillery has landed within two meters of our position and the closest 1,000 lb aerial bomb has landed 100 meters from our patrol base. This has not been deliberate targeting, but rather due to tactical necessity". MacKenzie interpreted this language for a reporter: "What that means is, in plain English, 'We've got Hezbollah fighters running around in our positions, taking our positions here and then using us for shields and then engaging the (Israeli Defence Forces).'" A senior UN official,replying about Maj. Hess-von Kruedener's e-mail concerning Hezbollah presence in the area of the UN base said. "At the time, there had been no Hezbollah activity reported in the area. "So it was quite clear they were not going after other targets; that, for whatever reason, our position was being fired upon." He went on to claim that the Israelis were told where the UN base was and that it was clearly marked but they bombed it anyway. According to the Pakistan Army spokesman, Islamic militants used girls as human shields in Pakistan during the 2007 Siege of Lal Masjid. The mosque's head cleric denied the allegations. On December 4, 2009, terrorists attacked a Friday prayer ceremony in a mosque in Rawalpindi, Pakistan, where Bilal Riaz, a graduate student, acted as a human shield to save his nephew's life. According to a Human Rights Watch report published on February 19, 2009, the LTTE had been preventing Tamil civilians from fleeing out of rebel held area and using them as human shields against a Sri Lankan Army offensive. The LTTE was principally responsible for the loss of civilian life during the final phase of the armed conflict through their action to use fleeing Tamil civilians as Human Shields. During the civil war of 2011, Gaddafi loyalists were acting as human shields in the Libya no-fly zone, to try to protect Gaddafi's compound and airports. In March 2016, during the second civil war, it was reported that two Italians who had been kidnapped in June 2015 were killed while they were used as human shields by Islamic State gunmen in Sorman. During the Syrian Civil War, the Syrian Armed Forces and loyalists were accused by Human Rights Watch of using residents of towns as human shields when advancing on opposition held areas, forcing them to march in front of the army. Witness from different towns across the country said that the army had kidnapped people and forced them to march in front of them when attacking towns and villages. The purpose of this was to protect the army from attack. HRW said "The Syrian army should immediately stop this abhorrent practice." Witnesses stated that the army forcibly used children and elderly people as well to deter anyone from firing on the soldiers. The Islamic State (ISIL) militants, Saudi-supported Syrian branch of al-Qaeda, and Jaysh al-Islam anti-Assad rebels were accused of using civilian residents of towns, Alawite civilians and captured Syrian soldiers as human shields. Russian troops are reported to have used local civilians to avoid defence shooting when storming the Ukrainian Navy headquarters in Sevastopol and Ukrainian naval vessels. Reports of Indian forces, both Army as well as counter-insurgent police forces, using Kashmiri civilians as human shields have sporadically appeared in the reports of media as well as in the reports of human rights organisations such as HRW. However, on April 9, 2017, A 26-year-old man, alleged by the Indian Army to be involved in throwing stones at Indian troops, was tied to the front of a Jeep belonging to Indian Army as a column of Indian troops was moving through a locality, the man was reportedly tied to the vehicle to dissuade other Kashmiri protesters from hurling stones at the Indian troops. The BJP led Indian Govt. stated that it will stand by the officer who took the decision (to use the young man as a human shield). Furthermore, members of the ruling BJP took to social media and threatened a country wide agitation if any action was taken against the erring military Major, identified as Major Leetul Gogoi. In recent years civilians have volunteered to serve as “human shields” to prevent military conflict. In January 2003, anti-war activists organised Human Shield Action to Iraq in advance of the March 2003 invasion. Ultimately, Human Shield Action brought 200 people to Iraq. Many of them left as they ran out of money and the likelihood of war became greater. Several of these human shields had to be rescued by U.S. Marines after Iraqis threatened them for opposing the invasion of their country. Rabbis for Human Rights agreed to act as “human shields” during the annual olive harvest to protect Palestinian villages from settlers. Rachel Corrie and Tom Hurndall, Western International Solidarity Movement (ISM) volunteers in the Palestinian territories, who died in 2003 and 2004 respectively have been described as “human shields” campaigning against house demolition. ISM, however, strongly takes offence at the use of the term human shield to describe their work, preferring it be used only to refer to when armed combatants uses civilians as shields. Not even Amnesty International defines volunteer activist's actions or activist's actions for non-military property as “human shields”, and regards only the direction of "specific civilians to remain in their homes as “human shields” for fighters, munitions, or military equipment" as “human shields”. According to the 3 definitions in the header of this article the 'volunteers to protect Palestinians' make them not “human shields outside the battlefield” but protesters or ordinary pro-Palestinian demonstrants. Wikimedia Commons has media related to Human shields. ^ "Practice Relating to Rule 97. Human Shields". International Committee of the Red Cross. Archived from the original on 2014-08-04. Retrieved 2015-01-13. ^ "The Last Escape". Penguin Books UK. Archived from the original on 20 February 2014. Retrieved 1 April 2015. ^ Antoni Przygoński: Powstanie warszawskie w sierpniu 1944 r. T. I. Warszawa: PWN, 1980, p. 242. ISBN 83-01-00293-X. ^ Bill Van Esveld (August 17, 2009). Rockets from Gaza: Harm to Civilians from Palestinian Armed Groups' Rocket Attacks. Human Rights Watch. p. 26. ISBN 1-56432-523-7. ^ Library of Congress (October 2, 2007). The Library of Congress World War II Companion. Simon & Schuster. p. 335. ISBN 0-7432-5219-5. ^ Appleman, Roy E. (1998). South to the Naktong, North to the Yalu: United States Army in the Korean War. Department of the Army. p. 240. ISBN 978-0-16-001918-0. Archived from the original on 2 November 2013. Retrieved 17 October 2018. ^ Schiff, Ze'ev; Ya'ari, Ehud (1984). Israel's Lebanon War. Simon and Schuster. pp. 144–150. ISBN 0-671-47991-1. ^ Mark Tully, Satish Jacob (1985). Amritsar; Mrs. Gandhi's Last Battle (e-book ed.). London. Archived from the original on 2018-07-06. Retrieved 2018-07-08. ^ Karim, Afsir (1991). Counter Terrorism, the Pakistan Factor. Lancer Publishers. p. 33. ISBN 9788170621270. Archived from the original on 15 July 2018. Retrieved 15 July 2018. ^ BBC News. "1990: Outrage at Iraqi TV hostage show Archived 2008-02-01 at the Wayback Machine". Retrieved 2 September 2007. ^ "United States of America Practice Relating to Rule 23. Location of Military Objectives outside Densely Populated Areas". International Committee of the Red Cross. Archived from the original on 2013-10-12. Retrieved 2013-10-05. ^ 'Human Shields' B'tselem 11 November 2017. ^ a b c "Mofaz: IDF to appeal 'human shield' ruling". Yediot Aharonot. 11 October 2005. Archived from the original on 27 July 2014. Retrieved 23 July 2014. ^ "Israel and the Occupied Territories Shielded from scrutiny: IDF violations in Jenin and Nablus". Amnesty International. 4 November 2002. Retrieved 2007-09-09. ^ Human Rights Watch, Jenin: IDF Military Operations,  Archived 2015-09-24 at the Wayback Machine "VII. Human Shielding and the Use of Civilians for Military Purposes", May 2002. ^ a b B'Tselem,  Archived 2011-06-04 at the Wayback Machine "Israeli Soldiers use civilians as Human Shields in Beit Hanun", B'Tselem, July 20, 2006. ^ [permanent dead link] UN Doc. Chronological Review of Events November 6, 2002, A military court in Israel sentenced two junior officers to 28 days imprisonment because they had used Palestinian civilians as "human shields", Israel Radio reported. A platoon sergeant who had made a navigation error and ended up in a Palestinian village with his soldiers had forced a villager to drive them to a safe place, the radio said. During the sergeant's investigation, a similar incident had come to light in the same battalion, during which a squad commander had made a Palestinian drive him and his soldiers to safety. "Another 36 homes were occupied by Israeli soldiers and used as watch posts. In every case of home occupation the IOF detained the inhabitants inside one room of the house"
^ a b "Israel's human shields draw fire". The Guardian. 2 January 2003. Archived from the original on 15 September 2017. Retrieved 14 December 2016. ^ 'Israeli army accused of new killing,' Archived 2016-09-17 at the Wayback Machine BBC News 16 August 2002. ^ Matthew Kalman (April 23, 2004). 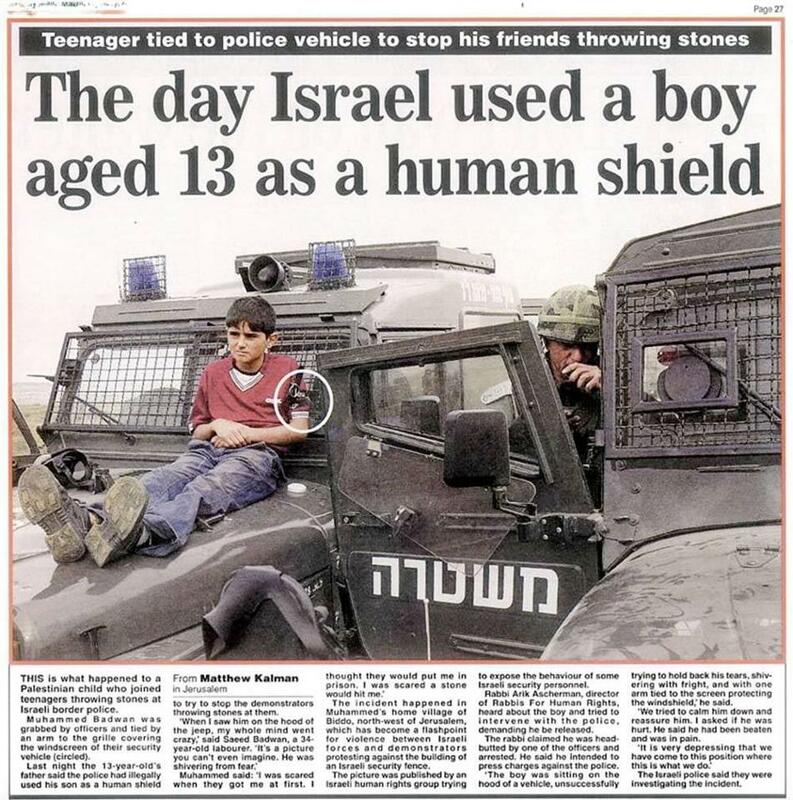 "The Day Israel Used a Boy Aged 13 as a Human Shield; Teenager Tied to Police Vehicle to Stop His Friends Throwing Stones". Daily Mail. Retrieved August 12, 2014. ^ a b "IDF to ask High Court to review ban on 'human shield' practice". Haaretz.com. 11 October 2005. Archived from the original on 2 April 2015. Retrieved 1 April 2015. ^ "IDF to appeal human shield ban". BBC News. October 12, 2005. Archived from the original on January 19, 2009. Retrieved April 11, 2011. ^ a b c  Archived 2010-02-16 at the Wayback Machine "Israel Probes "Human Shield" Allegations", CBS News, 11 April 2007. ^  Archived 2007-09-27 at the Wayback Machine "Israelis use Palestinian as human shield", The Denver Post, April 12, 2007. ^ "Israel accused of using Palestinian children as human shields". The Guardian. 9 March 2007. Archived from the original on 31 December 2016. Retrieved 14 December 2016. ^ a b "Breaking silence on Gaza abuses". BBC News. 15 July 2009. Archived from the original on 17 July 2009. Retrieved 18 July 2009. ^ Amnesty International Report "Operation Cast Lead": 22 Days of Death and Destruction pg 48-50, "Archived copy". Retrieved 2013-03-16. ^  Archived 2010-01-21 at the Wayback Machine "Impunity for War Crimes in Gaza-Southern Israel a Recipe for Further Civilian Suffering", Amnesty International. ^ a b Chassay, Clancy (2009-03-23). "Guardian investigation uncovers evidence of Israeli war crimes in Gaza". London: The Guardian. Archived from the original on 2014-08-25. Retrieved 2014-08-03. ^ a b "Israel soldiers on Gaza: Excerpts". BBC News. 15 July 2009. Archived from the original on 25 January 2014. Retrieved 21 August 2014. ^ "Breaking silence on Gaza abuses". BBC News. 15 July 2009. Archived from the original on 17 July 2009. Retrieved 18 July 2009. ^ a b "Israeli soldiers who used Palestinian boy, 9, as a human shield avoid jail". The Guardian. 21 November 2010. Archived from the original on 28 December 2016. Retrieved 14 December 2016. ^ "Two IDF soldiers charged with using 9-year-old 'human shield' in Gaza war". Haaretz. March 12, 2010. Archived from the original on March 13, 2010. Retrieved March 12, 2010. ^ "IDF soldiers convicted of using 11-year-old as human shield in Gaza". Haaretz. October 3, 2010. Archived from the original on October 6, 2010. Retrieved October 3, 2010. ^ "Two Israeli soldiers guilty of using human shield in Gaza". BBC News. October 3, 2010. Archived from the original on June 5, 2018. Retrieved June 21, 2018. ^ "Israeli troops demoted over Gaza 'human shield' boy". BBC News. November 21, 2010. Archived from the original on March 20, 2017. Retrieved June 21, 2018. ^ Israel: Soldiers’ Punishment for Using Boy as ‘Human Shield’ Inadequate (Report). Human Rights Watch. November 26, 2010. Archived from the original on December 19, 2016. Retrieved December 4, 2016. ^ "Palestinian children tortured, used as shields by Israel: U.N." Reuters. June 20, 2013. Archived from the original on March 7, 2015. Retrieved March 6, 2015. ^ a b "Israeli soldiers testify about violence against Palestinian children" (in French). Le Monde. 2012-08-21. Archived from the original on 2014-08-21. Retrieved 2014-08-20. One of the soldiers testifies that a procedure, though banned, [is still] used when the army comes to arrest a Palestinian suspect: soldiers send a neighbor, charged with asking the residents of the besieged house to come out. "I think that happened in Tulkarem. We made everyone come out, without finding the person we were looking for. So we sent the neighbors in, and afterwards a child. He had to make a tour inside the house, open all the doors and windows, lit all the lights." The commander of the unit said the procedure was illegal. "He declared he would rather that a neighbor be killed (…) if that made it possible to avoid one of his men from being shot while entering the house", said the soldier. The population has no choice but to cooperate. "When you knock on the door at night, with your gun shining under their face, your flashlight on their eyes, and you see he is not armed(…), he won't tell you he doesn't want to cooperate." ^ a b c Euro-Mid Documents Israel’s Use of Human Shields in Gaza (Report). Euro-Mid Observer for Human Rights. 2014-08-10. Archived from the original on 2014-08-21. Retrieved 2014-08-21. ^ FARES AKRAM; JODI RUDOREN (August 24, 2014). "Teenager Cites Ordeal as Captive of Israelis". New York Times. Archived from the original on May 19, 2017. Retrieved March 2, 2017. ^ AKRAM, FARES and JODI RUDOREN (24 August 2014). "Teenager Cites Ordeal as Captive of Israelis" (Middle East). The New York Times Company. Archived from the original on 29 November 2014. Retrieved 19 November 2014. ^ Bernstein, Prof. David (24 August 2014). "Why would the NY Times publish an uncorroborated allegation from the son of a top Hamas official?" (The Volokh Conspiracy). The Washington Post. Archived from the original on 29 November 2014. Retrieved 19 November 2014. ^ "A UN official: "Israel has turned a Gaza school into a military base"". Euro-Mid Observer for Human Rights. 9 September 2014. Archived from the original on 2015-11-21. Retrieved 5 January 2016. ^ Harel, Amos (August 3, 2004). "Analysis / Stoking an appetite for revenge". Haaretz. Archived from the original on November 28, 2012. Retrieved September 30, 2011. The photographs from recent operations show that the armed Palestinians use the many civilians in the area, including children, as a "human shield". Since this is done routinely, harming children (some, it is possible, by Palestinian fire) becomes almost impossible to prevent. ^ "Amnesty accuses Israel of using human shields in Gaza". Agence France Presse. 5 July 2009. Archived from the original on July 5, 2009. ^ Sterio, Milena (2010). "The Gaza Strip: Israel, its Foreign Policy and the Goldstone Report". Case Western Journal of International Law. 229: 244–245. Archived from the original on 2015-11-21. Retrieved 2015-08-13. ^ "Report of the United Nations Fact Finding Mission on the Gaza Conflict, 2009, p. 144" (PDF). guardian.co.uk. Archived (PDF) from the original on 2009-10-07. Retrieved 2009-09-15. ^ a b Norman Finkelstein,Gaza: An Inquest into Its Martyrdom, Archived 2018-07-31 at the Wayback Machine University of California Press, 2018 pp.68-81 pp.70-71,p.70. ^ a b EU strongly condemns indiscriminate Hamas rockets on Israel and use of Palestinian population as human shields, ‘terrorist groups in Gaza must disarm’, calls for ‘immediate ceasefire’' Archived December 31, 2014, at the Wayback Machine, European Jewish Press, 22 July 2014. ^ a b European Union: Hamas, other Gaza terror groups must disarm Archived 2015-04-05 at the Wayback Machine, Haaretz, 22 July 2014. ^ "Exclusive: Hamas rocket launch pad lies near Gaza homes". France24. 7 August 2014. Archived from the original on 2014-08-11. Retrieved 12 August 2014. ^ "Gaza reporters' tweets: Hamas using human shields". Jerusalem Post. 24 July 2014. Archived from the original on 29 July 2014. Retrieved 30 July 2014. ^ "Journalists threatened by Hamas for reporting use of human shields". Jerusalem Post. 31 July 2014. Archived from the original on 10 July 2015. Retrieved 10 July 2015. ^ a b "Hamas acknowledges its forces fired rockets from civilian areas". Haaretz. September 12, 2014. Archived from the original on September 12, 2014. Retrieved September 12, 2014. ^ Israel-Gaza conflict: The myth of Hamas’s human shields (Report). The Independent. 21 July 2014. Archived from the original on 25 July 2014. Retrieved 31 July 2014. ^ Harriet Sherwood (24 July 2014). In Gaza, Hamas fighters are among civilians. There is nowhere else for them to go (Report). The Guardian. Archived from the original on 30 July 2014. Retrieved 31 July 2014. ^ "Jeremy Bowen's Gaza notebook: I saw no evidence of Hamas using Palestinians as human shields". New Statesman. 22 July 2014. Archived from the original on 27 July 2014. Retrieved 25 July 2014. ^ Hamas Spokesman Sami Abu Zuhri: Human-Shield Policy Is Effecive. YouTube. 9 July 2014. Archived from the original on 9 March 2015. Retrieved 1 April 2015. ^ Hamas spokesman calls on Palestinians to create human shields. YouTube. 14 July 2014. Archived from the original on 19 July 2014. Retrieved 1 April 2015. ^ Benari, Elad, Canada. "Kerry Demands Hamas Release Kidnapped IDF Soldier". israelnationalnews.com/News/. AFP & Arutz Sheva. Archived from the original on 10 August 2014. Retrieved 8 August 2014. ^ DOCUMENT - ISRAEL AND THE OCCUPIED PALESTINIAN TERRITORIES: ISRAEL/GAZA CONFLICT, JULY 2014 (Report). Amnesty International. 2014-07-17. ^ Toameh, Khaled Abu (2014-09-07). "Fatah members killed in Gaza during war, Abbas reveals". The Jerusalem Post. Archived from the original on 2017-02-17. Retrieved 2016-10-29. ^ "A Soldier's Account from Gaza: How Hamas Used Human Shields". IDF Blog. 2014-08-25. Archived from the original on 2016-01-01. Retrieved 2016-10-29. ^ "An IDF Soldier's Experiences in Gaza". IDF Blog. 2014-09-21. Archived from the original on 2016-07-08. Retrieved 2016-10-29. ^ "First Hand Account of Gaza Operation by Wounded IDF Soldier". IDF Blog. 2014-08-05. Archived from the original on 2016-01-01. Retrieved 2016-10-29. ^ "Iraq War Vet: "We Were Told to Just Shoot People, and the Officers Would Take Care of Us"". Truthout. 7 April 2010. ^ Human Rights Watch, Fatal Strikes: Israel’s Indiscriminate Attacks Against Civilians in Lebanon, Summary Archived 2013-02-03 at the Wayback Machine, August 2006. ^ "Deadly Hezbollah chess match Archived 2006-11-07 at the Wayback Machine", The Washington Times, 26 October 2006. ^ "Israeli bomb kills UN observers Archived 2006-08-13 at the Wayback Machine", BBC News, July 26, 2006. ^ "Hezbollah was using UN post as 'shield' Archived 2007-05-17 at the Wayback Machine", Ottawa Citizen, July 27, 2006. ^ "Annan's Claims On Casualties May Unravel Archived 2007-02-09 at the Wayback Machine", The New York Sun, July 27, 2006. ^ Pakistan's Red Mosque Showdown: Jihadists Using Girls as Human Shields? Archived 2007-07-08 at the Wayback Machine, Spiegel International, July 5, 2007. ^ "Pakistani soldiers storm mosque". BBC News. 2007-07-10. Archived from the original on 2017-07-29. Retrieved 2008-05-10. ^ 17 children among 37 martyred in Pindi attack Archived 2010-05-31 at the Wayback Machine, Geo News, December 4, 2009. ^ Remembering Bilal Riaz Archived 2011-07-07 at the Wayback Machine, anasimtiaz, December 5, 2009. ^ "Sri Lanka: Civilian Deaths in War Due to LTTE Human Shields – PM - Sri Lanka Brief". srilankabrief.org. Archived from the original on 2018-05-19. Retrieved 2017-06-20. ^ Hartley-Parkinson, Richard (March 22, 2011). "For the sins of his father: Gaddafi's son 'killed in kamikaze pilot attack on barracks'". Daily Mail. London. Archived from the original on March 22, 2011. Retrieved March 21, 2011. ^ "Kidnapped Italians killed in Libya – Malta expresses 'deep shock'". Times of Malta. 3 March 2016. Archived from the original on 3 March 2016. ^ "Syria: Local Residents Used as Human Shields". The Huffington Post. Archived from the original on 29 December 2012. Retrieved 1 April 2015. ^ Kim Sengupta (12 May 2015). "Turkey and Saudi Arabia alarm the West by backing Islamist extremists the Americans had bombed in Syria". The Independent. Archived from the original on 13 May 2015. Retrieved 19 September 2015. ^ "Syria: Opposition Abuses During Ground Offensive Archived 2015-09-26 at the Wayback Machine". Human Rights Watch. 19 November 2013. ^ "Islamic State jihadists using human shields to avoid air strikes". The Daily Telegraph. 20 November 2015. Archived from the original on 22 October 2017. Retrieved 5 April 2018. ^ "Caged and in danger: Syrian soldiers become human shields for rebels". CNN. 3 November 2015. Archived from the original on 13 April 2016. Retrieved 31 March 2016. ^ "Syrian rebels using caged civilian captives as 'human shields'". The Daily Telegraph. 2 November 2015. Archived from the original on 31 March 2016. Retrieved 20 March 2016. ^ "Russian forces take over Ukrainian military bases in Crimea; Ukrainian naval commander missing". KyivPost. Archived from the original on 2 April 2015. Retrieved 1 April 2015. ^ "Marines cannot shoot because the Russians are using Civilians as Human Shields". Voices of Ukraine. Archived from the original on 2 April 2015. Retrieved 1 April 2015. ^ WithKashmir, Team (2017-04-15). "After The Viral Human Shield video, Kashmiris speak of personal experiences". With Kashmir. Archived from the original on 2017-04-18. Retrieved 2017-04-18. ^ Ashiq, Peerzada. "Army uses civilian as shield, sparks outrage". The Hindu. Retrieved 2017-04-18. ^ "Govt stands by officer in J&K 'human shield' row - Times of India". The Times of India. Archived from the original on 2017-04-17. Retrieved 2017-04-18. ^ "BJP MP threatens agitation if army major alleged of using man as human shield punished". kashmirlife.net. Archived from the original on 2017-04-19. Retrieved 2017-04-18. ^ "Human shield Britons quit Baghdad Archived 2008-02-26 at the Wayback Machine", The Telegraph, 2 March 2003. ^ "UK bus owner defends Iraq trip Archived 2005-03-27 at the Wayback Machine", CNN.com, March 4, 2003. ^ Coughlin, Jack; Kuhlman, Casey; and, Donald A. Davis. Shooter: The Autobiography of the Top-Ranked Marine Sniper Archived 2018-07-18 at the Wayback Machine. St. Martin's Press, (2005). ^ "Settlers clash with rabbis guarding Palestinian olive harvest near Hebron" Archived 2008-12-06 at the Wayback Machine Haaretz, 13 October 2008 Associated Press. ^ "ISM report Archived 2008-07-05 at the Wayback Machine", 5 May 2003.